Lovely room-our favourite one, which we love. Fantastic breakfast. Good safe carpark, and the most wonderful staff-old and new,and everything very clean. OK but food expensive with limited menu. Very nice staff at 1.3l0 am they gave us key to a cool room . On arrival gentleman on reception was briliant . Reception and other areas look very smart. Restaurant looked very nice. Check in was good and staff very helpful. Our room was typical of a standard Mercure. Very comfortable bed and had a great nights sleep. Was worried as our room faced car park and could see the motorway, but there was no noise whatsoever. Location of hotel is literally off the motorway. Despite the location of the hotel we were surprised to find that there is a lovely walk besides a lake and wooded area within a couple of minutes of the hotel. A great way to relax after a days driving. We had room service on our nights stay which was excellent. Very hot and tasty. Probably best room service we had had in a Mercure. Large shower room with separate toilet. Excellent staff as always, lovely room, lovely breakfast, nothing but praise from us. First time we have stayed at this hotel during our regular travels through France to Spain. It doesn't look very inviting from the outside but....Wow...the inside is amazing. After a long drive through France it was great to be able to have a swim in the indoor pool and also make use of the steam room and sauna.Our room was huge with plenty of storage and the bathroom fairly large too with an excellent shower area! The bar area and restaurant are very welcoming and relaxing. We ate in the restaurant in the evening and the food was excellent and very good value. Service was very good too.Reception staff were very helpful and informative advising us on the local area and the use/opening times of the indoor pool area.My only disappointment is that we haven't 'found' this hotel before and that we stayed only one night.....next time two or three nights to enable us to explore the local area and the nearby town. We've been travelling through France to Spain for many years and I'm disappointed not to have come across this hotel before! It doesn't look very inviting from the outside but inside....Wow! Our room was excellent; exceptionally clean and very well maintained. The bathroom was amazing! Loved the bar area and dining room....so welcoming. After a long drive from Calais it was so nice to have a swim in the indoor pool. On arrival the young lady on reception was very informative advising us on the area and the hotel. Excellent dinner in the restaurant and breakfast too. Would definitely stay here again and probably for more than one night. Is it a hotel or a gym? 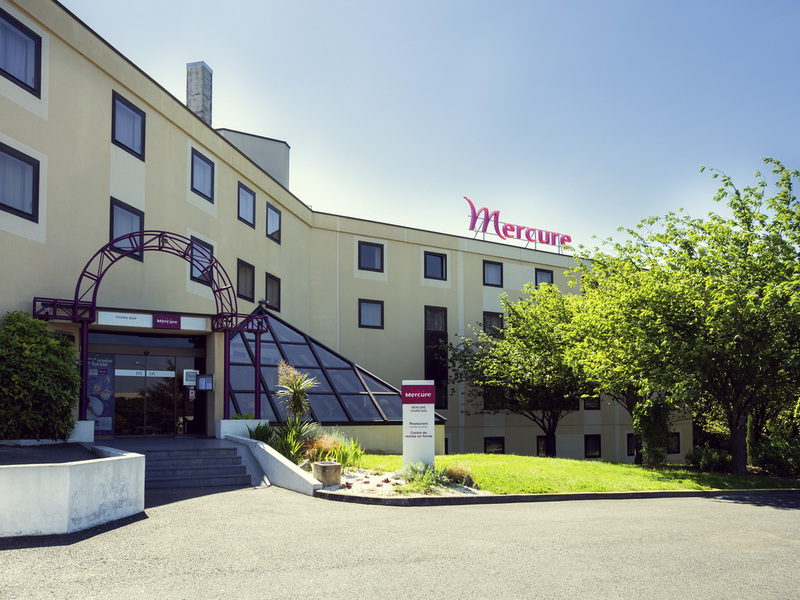 In the last year, I had a nice experience when I stayed in Mercure Nantes Sud. It is a good hotel with a good estructure, especially the swimming pool, the jacuzzi, the gym. I decided to repeat this experience in this year, staying in this with my Family.Now, the experience was very bad. The installations are used for classes offered for the city community. When we decided to use the swimming the pool, there were hidro-gymminastic classes. The Jacuzzi was occupied by the class people during hours as the sauna. It was impossible to use the installations.I payed for a hotel that offers this installations as included price. My selection was made because they were good options.I believe that the Hotel manager wants to reduce the costs of the operation. But, the first selection of the services is in direction of their guests, not for external people.Accord needs to know if they want do have a hotel or a gym. It is a very bad example of administration. A way to show how to lose clientes. The room was very comfortable and very clean , a bit noisy! As the room was very dark, the blackout curtains are great, a small night-light in the entrance hall or bathroom would be great to find the bathroom at night! The restaurant was good but the plat du jour menu needs a review- my partner had Pintade as a main with a good portion of meat vegetables and a potatoe dish; the fish had three small pieces vegetable but no potato, rice or couscous etc so was not enough food! The starter a pepper dish was delicious! The reception was very good in spite of late arrival and we were offered to have dinner. service was excellent. Clean and tidy, no use of chemical airfreshners in the room. At last clean fresh air. Restaurant not too bad, reasonable choices on the menu, service very good. No traffic noise heard from the room. Nice walk to the nearby lake, good exercise after the driving. Staff very welcoming. Room clean, did not smell of chemical perfume as so many Accor Hotels do. Wonderful. Food adequate and the staff friendly and helpful. Near a lake which is good for walking the dog. Efficient and welcoming. Excellent food and service. Room immaculate. Mercure Tours Sud is unique.Staff at check in was very efficient. Hotel easy to walk in. There is an outdoor swimming pool.The restaurant served a very tasteful food. I loved it.Beautiful village view from the window from my room.Quite far from the city but it was our choice. I would be there again without doubt.